Love it or hate it, iTunes still has its uses. While Apple has been able to reduce the dependency iOS devices have on needing to be tethered to a Mac or PC, there are some circumstances where it's unavoidable. To ease this burden, iOS include a feature called Wi-Fi Sync that allows it to connect and sync with iTunes without the need for taking up a USB port. iOS 5 was released back in 2010 and included two fundamental changes to the way that iOS devices would activate and sync. The biggest change was that, for the first time, iOS devices did not need to be plugged into a computer running iTunes in order to work. Before this, iTunes was a minimum requirement, even for an iPad. Secondly, Wi-Fi Sync was introduced as a means to sync an iOS device to iTunes wirelessly. Wi-Fi Sync offers much of the same functionality as using a USB cable, but there are two main limitations where a cable must be used. The first is that iTunes can only report the battery level when a device is connected via USB. In all honesty, this is not a big deal and doesn't impact Wi-Fi syncing in any real way. The second, however, does. Restoring an iOS device from a backup via iTunes can only be performed via USB, they cannot be done wirelessly. For non-iCloud users or those who prefer not to use the service for backups, a USB cable will always be required. 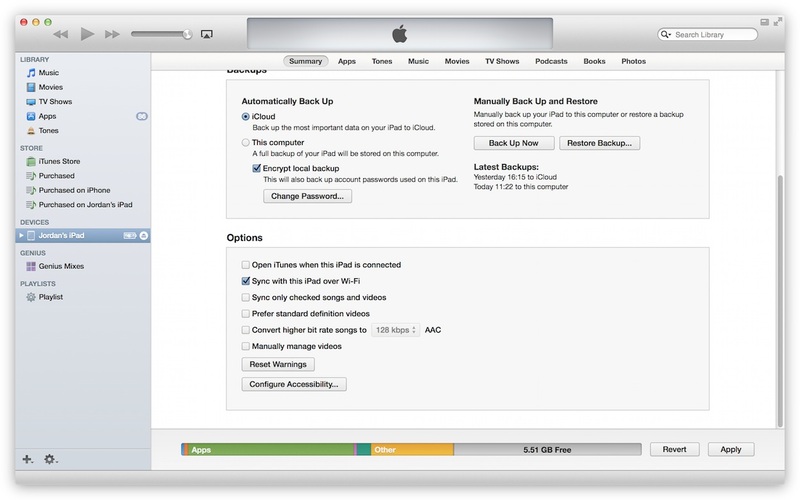 Backing up an iOS device can still be performed wirelessly. Wi-Fi Sync works as you'd might expect: both iOS device and iTunes computer need to be connected to the same local network. The computer doesn't need to be connected wirelessly as it will still work using a network cable, provided it operates on the same network as wireless devices do. For most home and business users, this will be the case. To enable Wi-Fi Sync, the iOS device must first be connected via USB. Once connected, launch iTunes and select the iOS device from either the sidebar (if it is visible) or the top-right, just under the Search box. The option Sync with this iPad/iPhone/iPod touch over Wi-Fi should then be enabled. After doing so, click Apply. After enabling the option, you should be able to remove the USB cable and see the iOS device still displayed within iTunes. You should also notice that the battery meter has now gone, since iTunes will only display battery information when connected via USB. 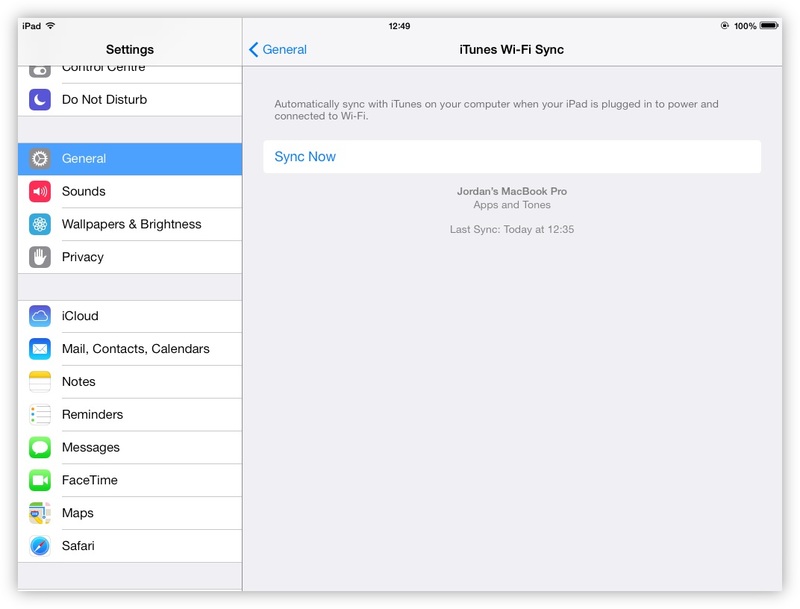 Wi-Fi Sync works exactly the same as using a USB cable, so syncing can be started from within iTunes at any time. If you have a Mac somewhere else in the house, you can also start syncing directly from the iOS device. Launch Settings and tap General > iTunes Wi-Fi Sync. iOS will display information about the last time it has synced with iTunes and allow you to start syncing by tapping Sync Now. Wi-Fi Sync provides a useful alternative to physically connecting an iOS device to a computer. Until the need for iTunes is removed completely, it's a useful way of syncing without fumbling around for a USB cable.